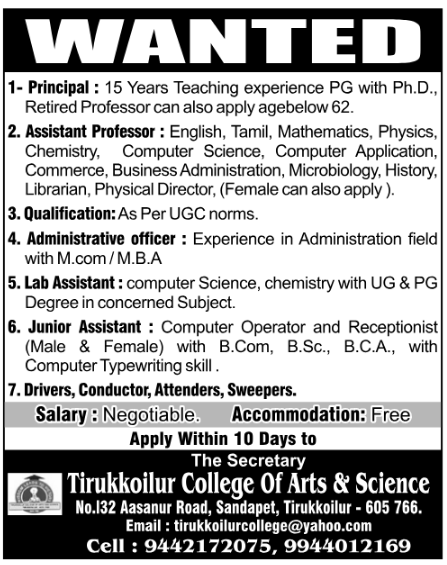 Tirukkoilur College of Arts and Science, Villupuram has advertised in the DINAMALAR newspaper for recruitment of Assistant Professor / Principal Plus Non-Faculty jobs vacancies. Interested and eligible job aspirants are requested to apply within 10 days from 19th March 2019. Check out further more details below. About College: Tirukkoilur college of arts and science was established at tirukkoilur town, villupuram district in the year 1999 by tirukkoilur educational& charitable trust functioning at no .132, asanur road, sandapet, tirukkoilur-605 757.Aiming to provide higher education at the college level to the students hailing from tirukkoilur and its surrounding rural areas .the trust is being run by good hearted philanthropists of tirukkoilur who show a keen interst in higher education.